This November, we are taking a focus on the classic and versatile martini, and aim to bring you some awesome martini content. 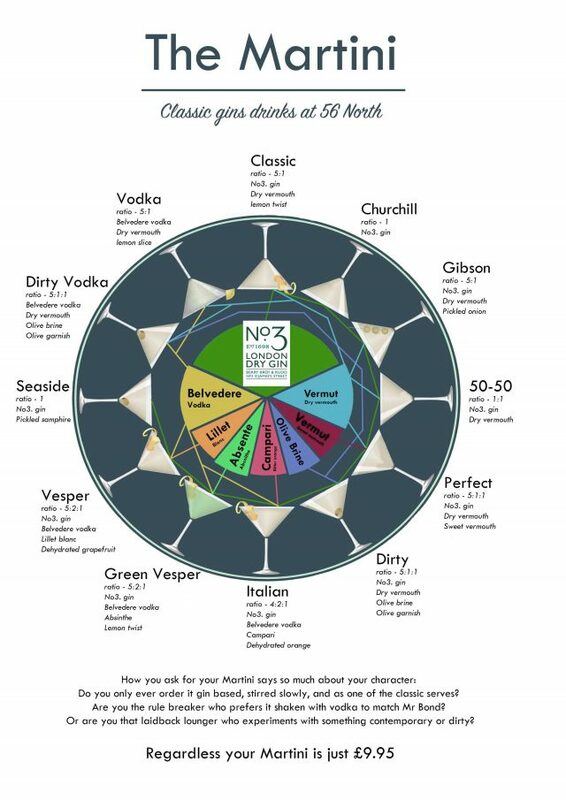 To find this, we decided to go out and ask some of the Scottish Gin bars with stills what their views are on the martini, any of their top tips and advice for martini-making and, of course, to share a great martini recipe with us. Through years playing with so many amazing gins I know my own pallet and I do lean to clean sweeter citrus notes. The history of the martini was as a pre-dinner palet cleaning drink. If you’ve never done this before a really good meal it’s a MUST as it makes the food sparkle! If I’m making a classic martini with a citrus twist. I’ve recently be using our experimental “56 North Distillery Edition Scottish Dry” for this straight from the freezer. I’m a fan of a 5:1 ratio of gin to really good vermouth (keep this in the fridge not the cupboard and it’s very much like tonic – buying quality makes a huge difference to your drinks). I’ve used Belsazar dry vermouth which you should be able to source from any good wine or spirits shop. I stir it down over lots of ice to further chill it and looking for it roughly to double in volume. Once done pour it straight into a coupe or martini glass with a lemon or orange twist. This is all if I’m in a classic mood…I do love to experiment with my martini’s. Don’t be scared to add a dash of differently-flavoured bitters to the mix, use different vermouths. Trying different garnishes is also great fun! You can use olives, pickled onions, citrus, anything really! Stirred over ice block until about double the liquid volume. I guess my original ethos was very simple, I liked gin and thought it fitted the venue well. From that we’ve never really looked back. I’ve had the privilege of watching the growth of the Scottish craft gin space and been exceptionally lucky to meet so amazing producers who have gone onto great things over the last 5 or 6 years. This if anything hasn’t slowed down and is simply getting bigger and bigger now. Of the +400 gins we’ve got a large leaning to Scotland with around 150 bottles currently as Scottish made. Our emphasis has always been on flavours and brilliant G&T is what we are best known for. We also have an extensive martini menu, cocktail menu and food menu so we cover all bases. We fitted a micro-distillery at the start of the year and have spent 2018 experimenting with amazing liquids. 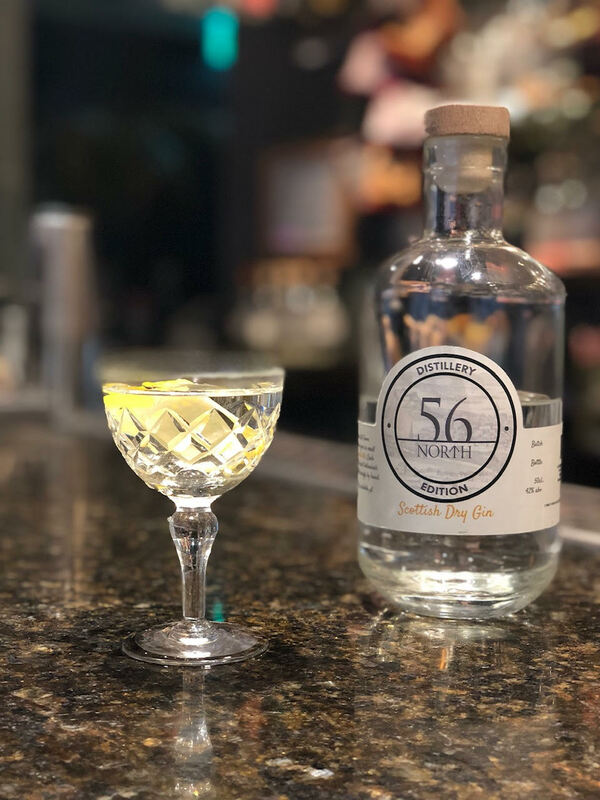 Watch this space for early 2019 as we are now at the stage we want to launch what we’ve been working on for over a year..
You can find out more about 56 North by visiting their website.